Lightly grease the base of a 20 x 30cm (base measurement) slice pan. Line the base and sides with baking paper, allowing the 2 long sides to overhang. Line each compartment of four 6-compartment giant silicone ice-cube trays with wide strips of baking paper, allowing the 2 sides to overhang. Stand the trays on a tray or board. Process the biscuits in a food processor until coarse crumbs form. Add the butter and process until combined. Transfer the mixture to the prepared slice pan and press evenly over the base. Place in the fridge until required. Place 125ml (½ cup) water in a bowl and gradually sprinkle the gelatine over, allowing it to absorb water before adding more. Microwave on High for 20 seconds, then use a fork to whisk until gelatine is dissolved. Set aside to cool to room temperature. Use electric beaters to beat the cream cheese, sugar and vanilla in a bowl until light and creamy. With the motor running, slowly add the cooled gelatine mixture. Add the melted chocolate and cream and beat until well combined. Transfer the mixture to a jug. Pour 1 cup of the cream cheese mixture over the biscuit base and smooth the surface. Divide the remaining cream cheese mixture evenly among the ice-cube trays (they won’t be filled to the top). Place slice pan and ice-cube trays in the fridge for 4 hours or until set. Lift the cheesecake base from the pan, remove the paper and place on a serving board. Carefully lift the cheesecake blocks from the ice-cube trays (use a knife to loosen). 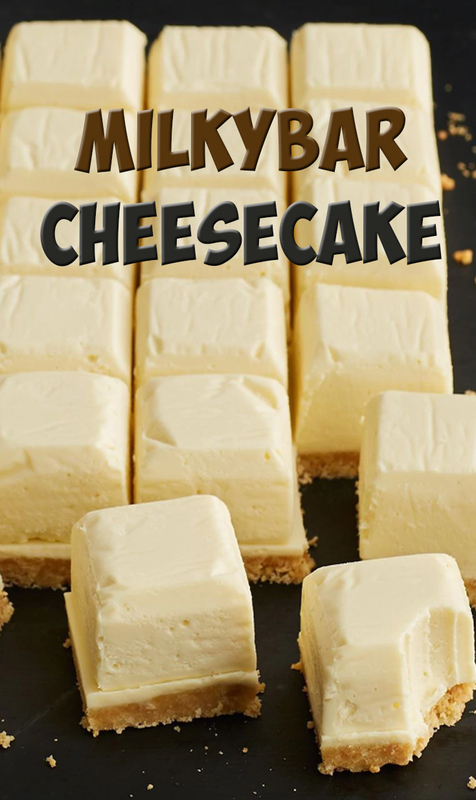 Arrange the cheesecake blocks over the base in rows to resemble a giant Milkybar. Trim the base edges. Cut into 24 pieces.